There's no doubt about it—Valentine's Day is coming up! Even if you think it's a made-up holiday or a for-real celebration of all things love, make some plans! Whether you decide to stay in and get cozy or hit the town, your Stylist has the perfect look. Read on for date night inspiration—whether you're staying in or going out. First things first, what are you doing? It might take a bit more effort, but planning a date night can be so rewarding. No matter what you decide to do, use it as an excuse to put on something pretty—maybe something a little more dressed up than your usual look. And, don’t forget, Valentine’s Day is coming up, so you might want to have a look that’s a bit more romantic on hand. Meeting friends (or that special someone) at your favorite cocktail lounge? Dress up your denim with a flirty top in a bright cherry red, pink heels and a clutch in the prettiest shade of blush. We love that a top like this can be repurposed and worn with a pencil skirt or your favorite work pants. Attending the theater or a concert? Make sure everything is in perfect harmony when you pair a printed dress with a solid moto—black and white as shown here—or in any color palette that lights up your face. 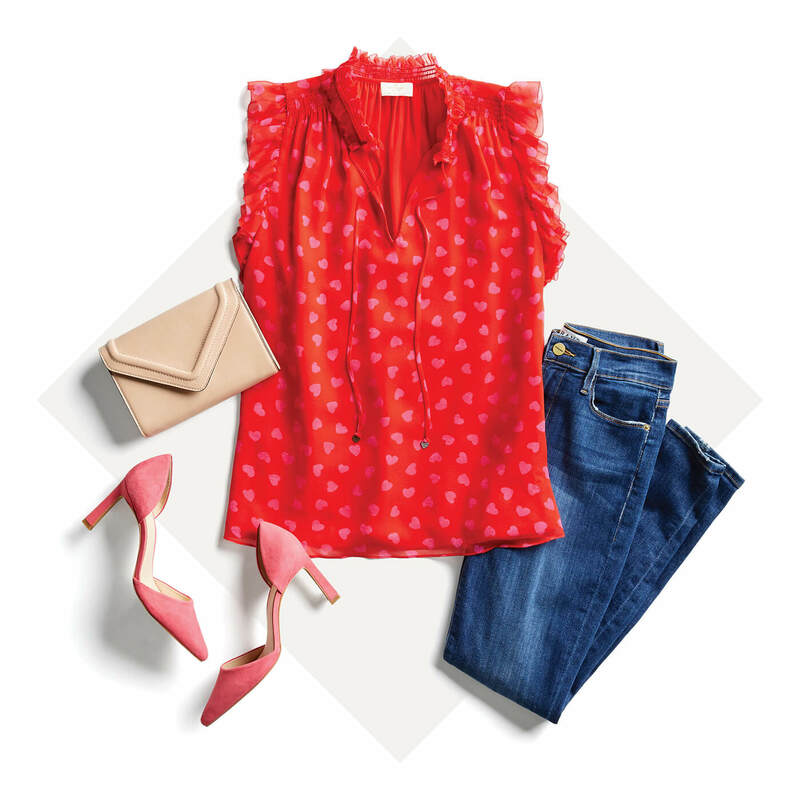 Finish the look with pointy-toed pumps for a dressed-up touch, and a clutch in a pop-y color (which will also look great paired with jeans for a brunch date). When gallery hopping or wandering through your favorite museum, opt for denim paired with feminine favorites. A graceful white top with delicate details is a great place to start—so romantic. Add a shoe embellished with a statement bow for even more girly flair, and just to keep things interesting—a clutch in a wild-but-not-too-wild animal print. There is no rule that says a date (even a romantic date!) has to include leaving the house. Whether you are just getting to know each other, or have been together awhile, doing something together at home can be really special. But, hold the holey sweats. Ask your Stylist for comfy but stylish pieces so you’ll always be ready to hang at home and look great doing so. Staying in to watch the big game? Score major points in the style department with a sporty look that’s comfy and just happens to be a style all-star. A pair of leggings with interesting detailing is athleisure done right, especially when paired with a tie-waist top in a cool neutral. Finish the look with sneakers in a fun print, and you’ll be set for game day. Feasting on a 5-star meal does not have to mean leaving your house—choose a recipe, invite that special someone over to be your sous chef and cook up a romantic date. Prep the perfect look, starting with a comfy-but-stylish pair of pull-on pants, top with a t-shirt and make sure you have a cute cardi on hand in case it gets chilly. Elevate the whole thing with a pair of metallic sneakers, and you are serving up your finest at-home look. Ah, movie night, the classic at-home date. What could be more perfect than curling up on the couch with your favorite action, romance or comedy films along with your favorite person? 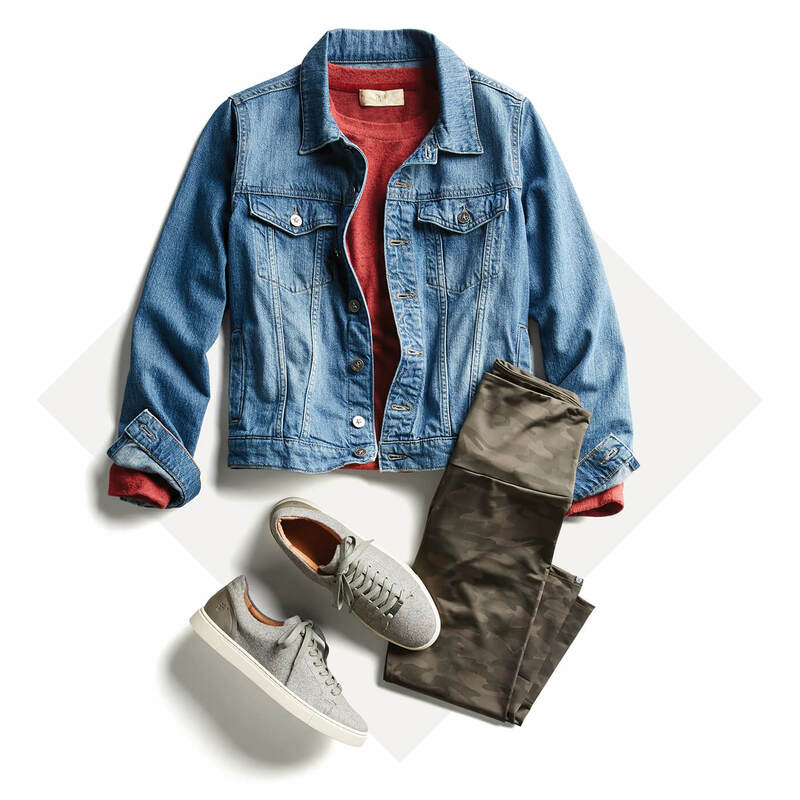 Keep it fashionable when you pop on a pair of on-trend camo leggings topped with a colorful button-up shirt and denim jacket—and add a sporty-casual touch with a cool pair of kicks. Pop the corn, melt the butter and settle in for the ultimate night at home. Ready for date night? Tell your Stylist what your plans are.